When it comes to candles and scents I simply can't get enough. I love having candles burning, wax warmers on or diffusers placed around the house. So naturally when I got the opportunity to partner up with Aspen Bay Candles a few weeks ago I was literally ecstatic! 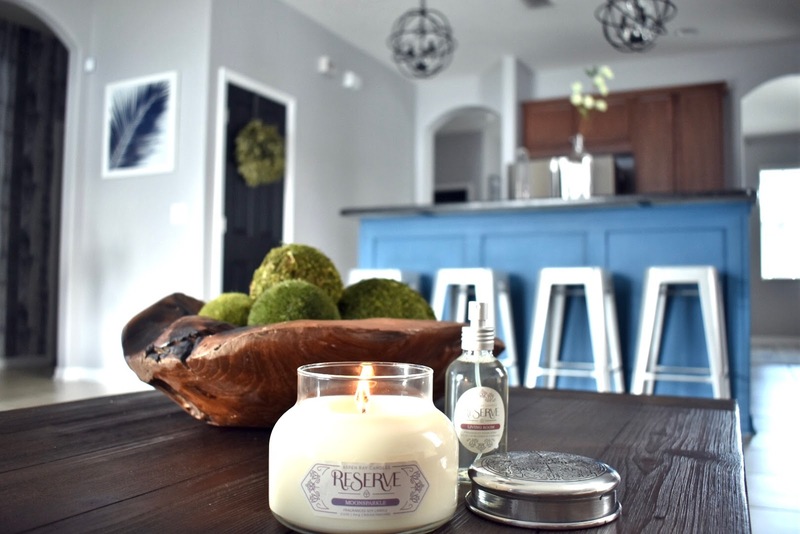 Aspen Bay is widely known for their outstanding candle fragrances and beautifully hand crafted candles. You probably also know their popular manufacturer CURiO. 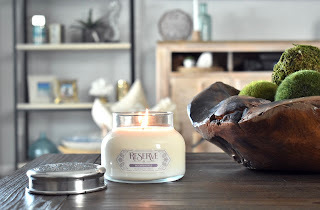 I was lucky enough to get to try out some of their newest candles in the "Reserve" Collection as part of my partnership! Today I am going to take you through some of the heavenly scents and products that I personally loved and have throughout my own home. My favorite candle to have out on display ever is their large signature jar. I have this beauty out right where I will see it on our living room coffee table. In the jar scent I am burning "Moonsparkle" which is a soft scent of red fruit accord violets and birchwood. The silver tin candle is so unique and literally doubles as a piece of decor. I have this in the "Sueded Tobacco" scent. I knew this scent and tin would be stunning in the guest room since I keep that room so simple and classic. The Reserve Tumbler is the perfect candle for any room. It's beautiful shape and detailed glass grabs your attention and compliments any decor. I have this one in our bedroom because I thought it gave off a romantic vibe ;) The scent I love in our bedroom is "White Tangerine" It has hints of tangerine, apple and vanilla bean. Okay, to me this right here stole the show. The room spray in "Living Room" is AMAZING. There is just no other word for it. Don't judge me but seriously...I may have sorta sprayed this on my clothes once or twice. (Hahahahha) For real you guys this spray smells so deliciously fresh and light I LOVE it. I spray it in all the rooms! Trust me on this one...you will love it. I love a good diffuser! With the girls running wild in the house diffusers are the perfect solution for rooms where I don't want to be burning a candle. I love them in smaller spaces (like the bathroom) however I have been keeping my "Orchid" diffuser in the dining room! It's so fresh and light and I enjoy knowing even when the kids are in the dining room having a snack there is not need to worry about a flame. Well that is a little peak at some of my favorite scents and products that Aspen Bay has to offer! Make sure you check back to my Instagram page to enter a giveway that will be happening soon...you guys didn't think I would forget about you!